Posted on 17 February 2010. 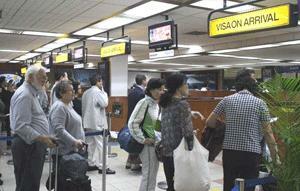 Chairman of the Bali Tourism Board (BTB) Ida Bagus Ngurah Wijaya complained about service at the airport. As the tourism industry, he often got komplin by foreigners or visitors who come to Bali. “The BTB stakeholders complain too much because of their many guests komplin of reporters and issue visa on arrival (VoA) is a problem faced by the airport,” he said. According to him, the airport plays an important role in the formation of image of Bali. “We can not forever like this, there must be a breakthrough from the government,”. Mentioned, the line at the counter very krodit VoA and it always happens. Tourists come to Bali to enjoy the beauty of the island of Bali. But what they get in Bali was so unexpected that they expect the service does not match keingginan guests. “They have to queue for hours just to take care of VoA,” he said. Bali Governor Made Mangku Pastika highlight a number of services at Ngurah Rai Airport, and this has memvideokan krodit and sent to the President. “Memvideokan I have no problem at Ngurah Rai Airport, starting from porter service, until the VoA service. The atmosphere of the airport as Sukawati market, “said Mangku, Sunday (14/2) and, in a meeting with media leaders. Krodit atmosphere that often occurs at the airport were sent to a number of parties. Initially no response from the central government, but after a week what evaporated. Statement of Minister of Culture and Tourism Jero Wacik and Minister of Justice and Human Rights, Patrialis Akbar during the inspection to the airport was not yet realized. The two ministers are immediately improved, but the results have not yet exist. Kekroditan still occur without a solution. Cases of fraud in the Customs & Immigration to the acceptance VoA revealed some time ago are evidence of chaos in the immigration control. Not only that, some part of VoA service equipment is not functioning properly so disturbing VoA service.